What a romp! I was only going to watch the first half of this last night, but instead stayed up late. In an increasingly unusual bonus, the DVD has several extras, including several really interesting looking trailers for foreign films. So far as I can remember, the Inverse Law of Movie Trailers doesn’t apply to foreign films. If you’ve ever seen or heard of The Hills Have Eyes, then you understand how the deep woods Redneck has often been used as a violent villain. 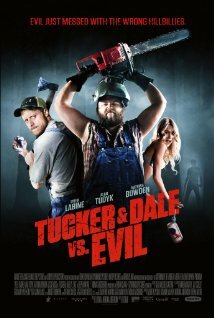 The whole premise of T&D vs E is simple and hysterical, turning that story completely on its head. The writer/director did a really great job of making everything clear and moving the action along. Even the buddy movie/love story aspects are well drawn and don’t feel like they’re bogging down the action. This is, hands down, one of the goriest films I’ve ever seen, but I have NEVER laughed this hard and this often at gore (this hard in The Evil Dead II and Shaun of the Dead, but never so often). If you miss one obvious movie reference, wait less than a minute and you’ll find another one. My favorite was Leatherface swinging his chain saw. I love Alan Tudyk . The last part of the movie slows as it gets a little formulaic but overall I highly recommend this film to anyone looking for something from a filmmaker who understands horror and knows how to pair it with humor. NOTE: M. wrote about the stereotype of the “deep woods Redneck” here – Media Thoughts: “Wrong Turn”. M. and Mildred agree on the silliness of the stereotype. May I just say that the T&D vs E trailer throws the Inverse Law of Trailers on its head? That looks like a good movie and…lo and behold! It IS a good movie.